We’d love your help. Let us know what’s wrong with this preview of NoSQL Distilled by Pramod J. Sadalage. The need to handle increasingly larger data volumes is one factor driving the adoption of a new class of nonrelational "NoSQL" databases. Advocates of NoSQL databases claim they can be used to build systems that are more performant, scale better, and are easier to program. "NoSQL Distilled" is a concise but thorough introduction to this rapidly emerging technology. Pramod J The need to handle increasingly larger data volumes is one factor driving the adoption of a new class of nonrelational "NoSQL" databases. Advocates of NoSQL databases claim they can be used to build systems that are more performant, scale better, and are easier to program. 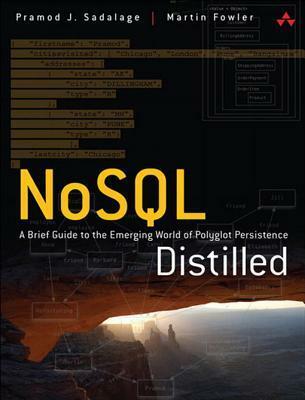 "NoSQL Distilled" is a concise but thorough introduction to this rapidly emerging technology. Pramod J. Sadalage and Martin Fowler explain how NoSQL databases work and the ways that they may be a superior alternative to a traditional RDBMS. The authors provide a fast-paced guide to the concepts you need to know in order to evaluate whether NoSQL databases are right for your needs and, if so, which technologies you should explore further. The first part of the book concentrates on core concepts, including schemaless data models, aggregates, new distribution models, the CAP theorem, and map-reduce. In the second part, the authors explore architectural and design issues associated with implementing NoSQL. They also present realistic use cases that demonstrate NoSQL databases at work and feature representative examples using Riak, MongoDB, Cassandra, and Neo4j. To ask other readers questions about NoSQL Distilled, please sign up. The first part deals with distributed databases concepts like different consistency types, resilience, CAP and the motivation for NoSQL. Very useful reminder for less theoretical people like me. The second part picks a sample database for each one of the different NoSQL types (key-value, column, document and graph) and explains its application with a little code sample. Each chapters ends with best and worst case scenarios for each database type. It works as a quick survey of current NoSQL and it' The first part deals with distributed databases concepts like different consistency types, resilience, CAP and the motivation for NoSQL. Very useful reminder for less theoretical people like me. It works as a quick survey of current NoSQL and it's mainly aimed to people with little or no knowledge of NoSQL and its applications. For people with some background on NoSQL, it lacks real world examples. Some of the examples provides are not worth reading. The world of NoSQL is still very young and very fresh. Most books about relational databases tend to be about a specific one, like Oracle or MySQL, and tend to deal with specific issues, such as performance or scalability but very few developers are using NoSQL solutions on such a scale as to warrant those kinds of treatments. The questions developers have about NoSQL don't call for books like "High Performance MongoDB: Optimization, Backups, and Replication", but that exact book exists for MySQ The world of NoSQL is still very young and very fresh. Most books about relational databases tend to be about a specific one, like Oracle or MySQL, and tend to deal with specific issues, such as performance or scalability but very few developers are using NoSQL solutions on such a scale as to warrant those kinds of treatments. The questions developers have about NoSQL don't call for books like "High Performance MongoDB: Optimization, Backups, and Replication", but that exact book exists for MySQL. 1) What the heck is NoSQL? 2) What are the different kinds of NoSQL databases? 3) What does it look like to use them? 4) Which NoSQL database should I use? That last question is the one that most people get hung up on. NoSQL is an umbrella term that covers a lot of different technology, and the individual elements under this umbrella can differ greatly. A data model that lends itself well to a particular NoSQL database might be completely wrong on another NoSQL database. NoSQL Distilled aims to be a very short and concise introduction to this umbrella term, with a particular focus on answering this last question. Rather than simply being a series of chapters, each one covering a different NoSQL database, Distilled tries to pull out the elements common to these technologies and focus on the underlying principles. In a way, it's like Fowler's other books, in that the first half is general principles, and the second half is specifics that go deeper on those principles. We don't really see any actual NoSQL databases until about the halfway point, after Distilled has explained the various types of clustering strategies, performance concerns, and patterns of NoSQL databases in general. I liked this approach very much. It allows the reader to focus on what actually matters about NoSQL databases, such as why they exist, what they're good at, what they're bad at, and what principles they follow, before getting into specifics like syntax or deployment. Martin Fowler has always been one of my favorite tech authors, and though his co-author is new to me, I definitely felt like I was reading a typical Fowler book. Occasionally dry but still dense with information, covered competently and explained well. I also appreciated the complete lack of marketing/hype, which is present in most other NoSQL books (often written by people affiliated with the projects). NoSQL distilled is clear in that it says you should probably use a relational database still, and only use NoSQL if you can prove it has a particular benefit for you. A great overview of NoSQL databases in under 200 pages. I wish most books would cut the clutter and reach the same level of brevity, which is so easy to read. Concise, conversational, and holds up well about 5 years on as an accessible reference to NoSQL databases. Martin Fowler books are traditionally from very high quality (Pramod Sadalage is a new author for me but I could expect that he works at the same professional level). In this respect the "NoSQL Distilled" is not much different. All the most important concepts are very accurate defined and detailed described. What is the best way to design aggregates, why transactions have lost its importance, sharding, replication and consistency issues - everything is explained with precise clarity. One gets an Martin Fowler books are traditionally from very high quality (Pramod Sadalage is a new author for me but I could expect that he works at the same professional level). In this respect the "NoSQL Distilled" is not much different. All the most important concepts are very accurate defined and detailed described. What is the best way to design aggregates, why transactions have lost its importance, sharding, replication and consistency issues - everything is explained with precise clarity. One gets answers to most of possible data design questions in the first conceptual part of the book. The number one reason for the use of NoSQL databases is not performance and should be our use case. This means if our data model does not fit well in to the relational model, rather than twisting the data we can choose alternate data stores. This is absolutely critical if you want NoSQL to be used in most of the mid sized enterprise applications. Also companies will start to believe that they should consider NoSQL it even if they are not Google or Amazon. When I was reading the book I thought th The number one reason for the use of NoSQL databases is not performance and should be our use case. This means if our data model does not fit well in to the relational model, rather than twisting the data we can choose alternate data stores. This is absolutely critical if you want NoSQL to be used in most of the mid sized enterprise applications. Also companies will start to believe that they should consider NoSQL it even if they are not Google or Amazon. When I was reading the book I thought that Polygot persistence is about using multiple data stores in same application depending on the use cases. But authors also seems to suggest that applications should wrap around the data stores with services ( like web services or REST). If we need to do this ideally we could only have one data store accessed by one service. Which would conflict the first statement. I am not sure about the reverence this question but I would love to have read more about using the different data store in the same application and its pros and cons. This is a very great book if you are looking get in to wild jungle of NoSQL databases. The authors does a great job in giving the brief introduction and making sure the basics are covered. A quick and concise introduction into the world of NoSQL. Explains the 4 primary types of solutions really well. Provides good fundamentals into how to reason about your data in order to make it compatible for use in NoSQL solutions. The scalability considerations are very well thought out and give enough context to apply when designing for your specific cases. Very well done - bravo to the authors. I've liked it very much. It was precisely what I was looking for, so a broad overview of NoSQL databases, advantages and shortcomings. Don't expect any deep dive into particular technologies, it's more a birds eye view on 4 different NoSQL db types: key-value, document, graph and wide-column databases, how they work, where they come short.. And as such, I think this book delivers. As clearly stated by the authors in the who should read this book section, this book won’t answer all your questions about nosql databases but will help you ask good questions. Overall this book presents a nice overview of the topic. Good introduction. Lacks real world examples. A good primer for the beginning NoSQL enthusiast. Sets you up nicely to make an educated decision as to which types of NoSQL databases exist and whether they will be useful in your organization. I would recommend this book. Good short light book. Nothing new for me but it was required to have a ground in technical discussion. Now I definitely love Microsoft CosmosDB because it hides lots of stuff behind and provides only service for solution. Watch Youtube video from Martin Fowler, you will be able to finish this book really fast. The best book I could find for a short primer on NoSQL data stores. chapter 2 is good for knowledge nosql benefit,but is a little complex to understand,you can read twice to feel. the chapter 2 tell me what is aggregation model and how to model it. chapter 3 tell me the schemaless database and the difference relational and nosql database. chapter 4 let me know nosql distribution benefit,replication and shard.from single server to peer-to-peer. chapter 5 is a little difficult to understand.you could get the general conception,but not deep to understand. chapter 6 is g chapter 2 is good for knowledge nosql benefit,but is a little complex to understand,you can read twice to feel. chapter 6 is good to tell how to involve the transaction problem with stamps.what is the transaction problem.how to involve master-slave problem with vector version stamps. chapter 7 is about map-reduce.it is a design pattern,and essential.the chapter is easy for read.and it says hive and pig for map-reduce.so you can find the books about hive and pig to acknowledge.and the hadoop essentially use map-reduce,so you can learn it to acknowledge more information about map-reduce pattern. Concise but at the same time exhaustive introduction to the world of NoSQL. The author goes gives a good insight of what NoSQL db are and why differently from other failed attempts they actually had success and at the moment their usage is always more frequent. The author also compares NoSQL vs sql-like technologies and provide the reader with enough knowledge to decide whether or not to use NoSQL products. The conclusion of the book, that I personally share, does not state which technology is bes Concise but at the same time exhaustive introduction to the world of NoSQL. This is a short and quick-to-read book like Martin Fowler's UML distilled I appreciate so much. Unfortunately, this one doesn't reach its target. Too much space is dedicted to sub-important topics, whil the important ones (the discovery of the different NoSQL flavors) could take advantage of a better treatment. I mean, they deserve 2 or 3 times more space with real samples showing how we use them. NoSQL Distilled has provided the technical community with a much needed broad overview of non-relational schema products in a quickly digestible manner. There are many materials that individual dive deep into a specific NoSQL technology. However, none have taken such a wide swath of material to cover. Fowler and Sadalage have done a superb job of distilling the importants facets of the NoSQL movement and technologies. 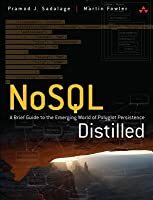 For a detailed overview of the book, see my summary here: http://chrispwood.blo NoSQL Distilled has provided the technical community with a much needed broad overview of non-relational schema products in a quickly digestible manner. There are many materials that individual dive deep into a specific NoSQL technology. However, none have taken such a wide swath of material to cover. Fowler and Sadalage have done a superb job of distilling the importants facets of the NoSQL movement and technologies. It reads really well. I came away feeling like I'd just watched a conference talk about "What is NoSQL". Nothing too deep, but more informed about what/why/how and ready to go find out more. This was intentional (the authors said as much in the first chapter), and I think it worked well. If you have ever wondered about the whole NoSQL craze, and whether or not it's even worth diving into - this book is perfect for you. It can literally be read cover to cover on a plane ride, or over the course of a day with a cup of tea or two. The authors take each acpect of the different datastore types available within the NoSQL ecosystem, simplify their use cases, and present examples of code to illustrate the pro's and cons of each. Highly recommended if you don't know where to start. Since my career as a programmer maps the historical period that lead up to the creation of NOSQL databases and the burgeoning polyglot paradigm I didn't think I would need this book. But it did help position nosql as a solution set of concerns that anyone developing for the web today has - how to architect, scale and manage for change in a world of global deployments and endpoints with varying capabilities. Its good manager primer on the topic - now on to more hefty reading, or just coding. This book does a good job of explaining the need/use-cases for the NoSQL databases. A lot of different types of databases maybe could have done better with more pages, but then I guess this is in line with the intent of the book, i.e. the author wanted to more of explain to user, when should you use which databases, rather than explain how to use the database. For those who want to get an idea what the various strengths and weaknesses of the different styles of NoSQL datastores are, this is the book. It is concise, to the point and detailed enough to get an idea when to use one or the other type, or multiple. Al this in about 200 pages. As with any book on an emerging technology some of the examples are already a bit outdated, but that doesn't distract from the main topic. This book starts with an introduction on horizontal scalability and how databases are involved in this problematic, and how NoSql helps to solve this; on this topic CAP Theorem very well explained. Then the book shows the different types of NoSql showing some examples and declaring pros and cons. It was what I was looking for, a book with a wide introduction on concept, principles and terms regarding NoSql. After this book you can choose a NoSql and than take a specific book on that one.